Chiang Mai province has some of the most beautiful jungles in Thailand. Combined with the mountainous areas, this sets the stage for some excellent zipline adventures. There are numerous day-tour ziplines close by Chiang Mai city. But which one is the best? Over the years we've gained experience with many of them, so let us help you make a good choice. Please read our Top 3 Ziplines in Chiang Mai-blog below! A zipline is a long cable between two high points that allows you to 'zip' over it. To do that, you wear a safety harness that is hooked up to a pulley (a little device attached to the zipline that 'rides' over the line). Going from high to low(er), you can then jump off one platform and ride the zipline to the next one, using only gravity! Some ziplines are steeper than others, but you can manage your speed using breaks on the pulley. Some of the zipline adventures also feature abseiling. When you abseil you are strapped in a harness and use pulleys and a line to descend vertically. The jungle of Chiang Mai is one of the best places to go ziplining in the world. The lush forest features very high trees and the rolling countryside presents a spectacular view when high up in them. Of course, the view only gets better when you are on the zipline! Added bonus is the local elevation, meaning it is a good place to get away from the heat. Furthermore, the ziplines at our Top 3 zipline adventures receive regular safety checks to make sure no accidents happen, also thanks to highly trained professional staff. Added convenience is the closeness of the wilderness to the city of Chiang Mai. Going ziplining at our Top 3 zipline adventures won't see you in transit for more than an hour each way. Who can go on a zipline? What do you need to bring? All the zipline adventures in our top 3 are for all ages. These zipline adventures all have experience with very young kids to seniors. Staff are well trained to make many accommodations for the guests, although there is a maximum weight limit of 120kg per person. The minimum height is 1 meter (3ft), to make sure all adventurers fit in the harness properly. Going on a zipline adventure involves some walking and naturally people with severe vertigo should stay at home. But, if you want to push your boundaries; these adventures ease you into higher and longer ziplines as you go. Joining a zipline day-tour is easy and you can choose to be picked up anywhere between 6:30 in the morning to 12:30 in the afternoon. When you go on a zipline-tour you should wear sturdy closed shoes and comfortable clothes. Also, It is a good idea to bring mosquito spray and sunscreen. Don't wear impractical jewelry, because it might get tangled with your zipline gear. Of course, also make sure you bring your camera! With all the practical stuff out of the way, here is our Top 3 zipline adventures! A choice for Skyline Adventure will take you to the heart of the northern Thai jungle. A day-tour here includes 3 hours of pure ziplining fun in a program of about 6 hours total. Skyline Adventure features 24 different ziplines, with its longest one an impressive 900 meters, and these are connected via 42 different platforms and 4 sky-bridges. Especially being on the longer lines will make you feel like a hawk flying over the dense jungle and valleys. The more daring adventurers can also do two abseils. The staff at Skyline Adventure is very friendly, helpful and professional. A day-tour at Skyline Adventure is 2000 THB. Included are a tasty Thai lunch, drinks like water, tea and coffee, seasonal fruits, insurance and a round-trip from Chiang Mai city. Flight of the Gibbon started more than ten years ago as Thailand's first zipline adventure. As the name suggests, it is unique in that its situated in a nature park that has wild gibbons. So not only will you feel like a gibbon, ziplining from treetop to treetop, but you also have a chance to see them around you. Flight of the Gibbon has over 5 kilometers of ziplines up in the trees, connected through platforms and sky-bridges. 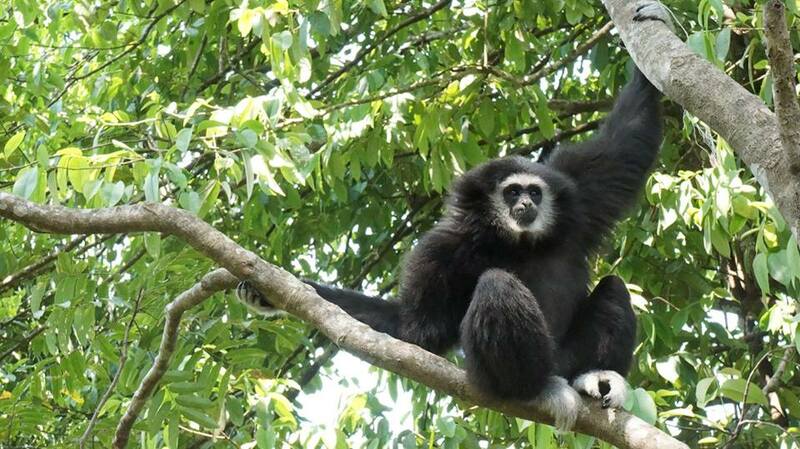 A day tour to Flight of the Gibbon lasts about 7 hours, of which 3 hours you spend zipping among the trees. Staff here are very well trained, having built up 10 years of experience organizing these day tours. Like Skyline Adventure, Flight of the Gibbon offers a Thai lunch, but it also features an optional visit to a local waterfall or temple. A day tour to Flight of the Gibbon costs 3999 THB, which naturally also includes insurance and the round-trip transfer from and to Chiang Mai. 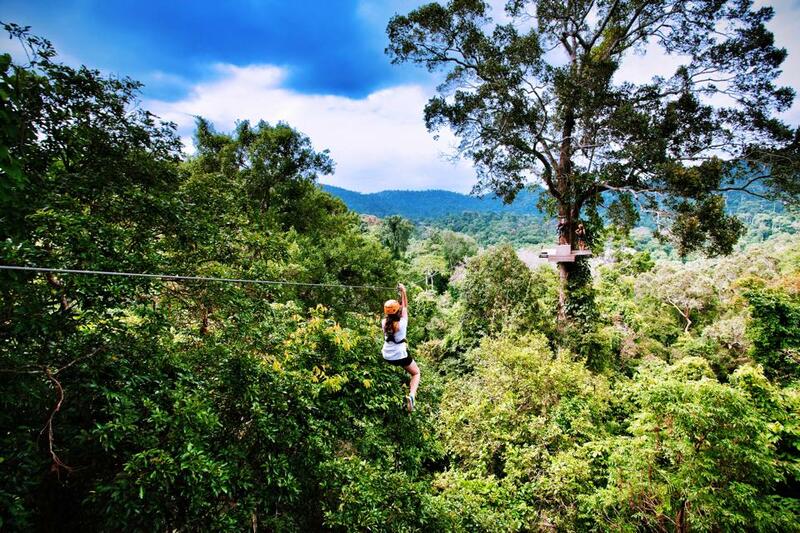 Jungle Flight is in our opinion the best zipline adventure Chiang Mai has on offer. It boasts not only the longest single zipline of a 1000 meters long, but it also has a true zipline rollercoaster! The 1000 meter zipline gives you an amazing view of the treetop canopy and mountains around you. On the rollercoaster zipline, you go down the 1100 track in under 4 minutes, making slalom turns, steep drops and even a full 360 degrees turn! The standard package at Jungle Flight has 19 ziplines total, connected through 39 platforms and 2 sky-bridges. It also features an abseil. There are different package, for example one that excludes the rollercoaster but includes more ziplines and abseils. Ask us for details! Jungle Flight calls itself an eco-adventure because its ziplines are constructed in a way that allow the trees to grow naturally. Like the other zipline adventures in our Top 3, included are a nice Thai lunch, insurance, and the round-trip from and to Chiang Mai. This is our favorite zipline adventure for a number of reasons. It has high emphasis on safety, using top of the line zipline gear. Jungle Flight, with its longest zipline and the rollercoaster puts itself ahead of all the other ziplines in the excitement and fun category. All in all, with a price per person of 2500 THB, it beats the competition hands-down in price-quality ratio. Ziplining is really for all ages. Last year we sent our 82-year old guest to Jungle Flight. He had so much fun that he booked the same tour again for the next day!